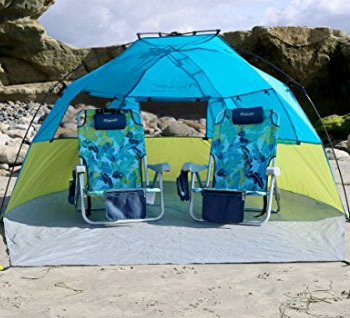 When you’re on the beach and feel like you have had too much sun; a beach tent can be the perfect companion to get you out of the sun for a bit but still enjoy the delights of the beach. 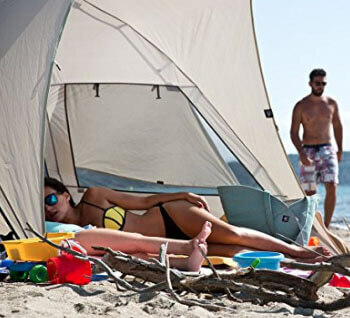 Here we take a look at the best beach tents on the market, so you don’t have to worry about dragging around something that really doesn’t cut the mustard. Easy set up - within seconds. Extra protection from the elements. They give you a great little space to get out of the sun when your skin needs a break. You don’t have to go off the beach in order to get some shade. They can also be great for protecting against the wind and sand. Sometimes it can be pretty windy on the beach and difficult to eat/drink or do anything without your hair going in your face. Also if you prefer a bit of more cover up while getting changed they can provide this too. It is a much better option than trying to wiggle your swimsuit off while simultaneous trying to prevent your towel from dropping to the floor. This is a great way to eat without getting food in your sand too. A nice little cubby hole to take a break. Somewhere to put your stuff. As well as being great for sun protection, eating and getting changed in’ a tent can be a great place to put your belongings. It is always nice to have them all in one place and protected from the sand and water. As well as protection from the elements, you will also be shielding your stuff from would-be thieves. If they can’t see what is up for grabs, they will be less inclined to steal from you because they would be going in not knowing if you actually have anything in your tent worth nicking. No one wants sand in their food! A tent gives additional protection against sandy food. It can also keep it cooler too because you will be keeping it in shade. A beach tent is particularly handy for putting a baby in so they can nap out of the sun. They can also be a great way to let your toddler play out of the sun. 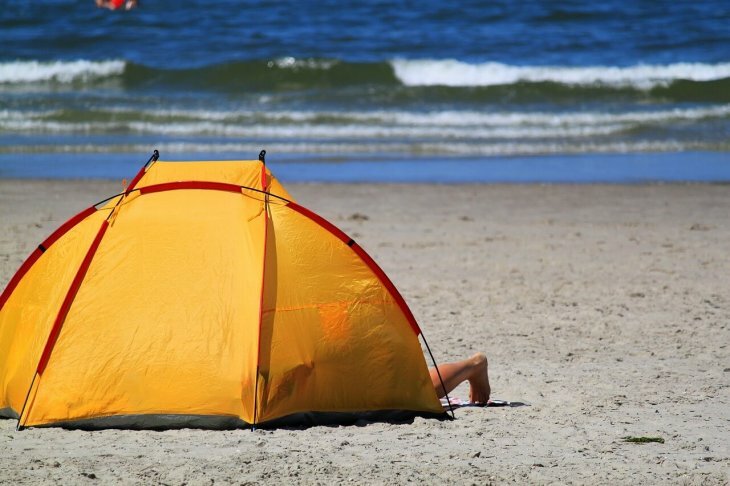 There are many uses for a beach tent and they don’t all revolve around just one person using it. 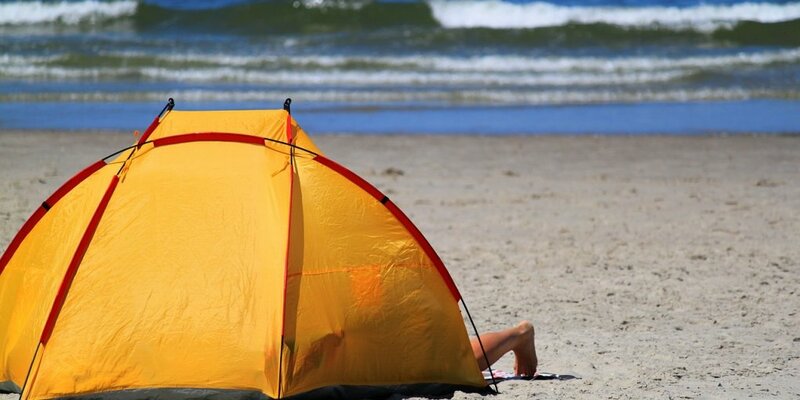 Here we take a look at some of the things you should consider before purchasing a beach tent. First you need to figure out who it is for and who will be using it. Do you want a tent specifically for your baby or do you want one that is going to cater for all your family. How many people will use it? There are many different models to cater for different needs, so figuring out exactly who is using it will make it much easier to choose. You also need to work out the size you want. Can you get away with something small despite how many people will be using it or do you want something big you can all use? You might also want to use it as a play area for a small child to give them a break from the sun. With size comes how portable your tent will be. No one wants to drag around something heavy if it isn’t going to be used to its full potential by you and your family. So while factoring in who is going to use it and what size you need, you may also want to figure out what this means in terms of portability. Some beach tents can be time consuming to set up, so if you don’t want to spend ages doing that, you might want to consider a quick set up tent instead. Of course there will always be a pay off in other areas depending on what type you go for. Generally speaking most high quality beach tents will be made from polyurethane or polyester or even nylon. These are light but weather resistant. You can also get tents that have UPF sun protection which you may want to consider if the sole purpose is getting out of the sun for a bit to give your skin a rest. I think is an important aspect of choice. When on the beach your tent is probably going to get filled with sand and it may also get wet if you jump into it after going in the sea. You won’t really want to be putting your tent away wet and sandy so you need it to be easy to clean. A quick wipe down outside your car is probably the most ideal scenario you want. Unless you want to spend ages cleaning the thing, I would look for reviews that mention ease of cleaning. Pop up beach tents are great because they literally assemble themselves by popping out and into their useful form. This means no fumbling around trying to put the tent up yourself. They are also very lightweight and thus easy to get to the beach with in the first place. Of course, these do come with some downsides. They can be more expensive and if you don’t get a good brand can be a nightmare to pack away back into their storage bag. Canopy tents are usually intended for 2 people or more. They can be really big where they fit lots of people under but for the beach you will be wanting something a little smaller and more manageable unless of course you are having a party on the beach! As well as the beach they can also be used for the garden too. This type offers shade but also is open so you can still see out well. They can also be zipped up so you can change but the ability to see out and enjoy the view while being shaded if a bonus and gives more versatility to how you can use it. Cabana tents are usually self erecting and usually come with UPF coating for extra protection against the sun. A baby beach tent is intended for a baby. This are small, easy to put up and useful for keeping a baby out of the sun but also for a toddler to play in. They can also be a great way to stash your belongings too away from the sand. 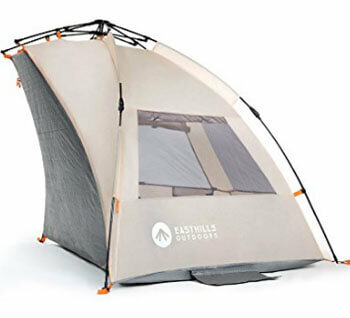 Easthills easy up tent features an easy up mechanism, zippered front porch and much more. 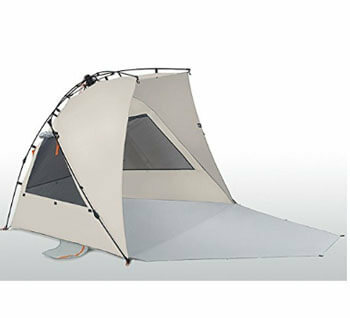 This is an all-rounder with literally all the features you would want from a beach tent. Where other brands lack one of two features, this one does it all. First it is very easy to put up and has 4 steps you need to follow. First you need to untie and spread the tent, then you need to unfold the poles and make sure the joints are straight. Then you grab the top 2 drawstrings and pull them up. Lastly you pull the drawstrings in opposite directions until the lower and upper hubs clip into place. That’s it. 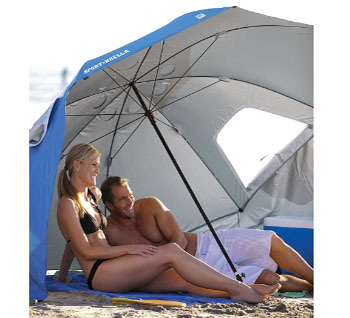 The fabric of this one has SPF 50+ sun protection which is similar to most beach tents. It also has 50 inches of center height, is 47 inches deep and 82 inches wide. This is generally plenty of room for 2 adults to fit in comfortably with beach chairs and also a great option for kids if this is why you want one. There are 4 internal mesh pockets for storage and 3 roll up windows so you can make sure your tent has good ventilation. 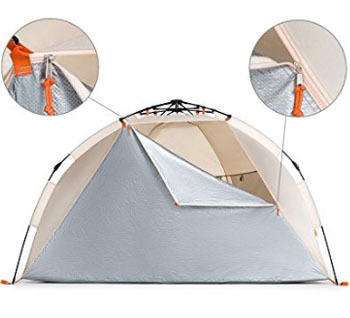 There is also a Velcro sand pocket as additional support for keeping your tent in place. The front porch also zips up so you can get privacy if you need to change into your swimwear or back out of it. This is a feature that seems to be lacking on quite a few models and something many people prefer to have. PROS: Well built, has privacy for changing, lightweight, sturdy, extended floor and great customer service. CONS: None we can see. If you are looking to find a large sun shelter/beach tent then the Kau Kohu tent is the right choice for you. It has 61 square feet of floor surface and can accommodate up to 5 adults. This is certainly the perfect option for a large family. It is also very easy to put up and it pops up in seconds, just like some other options in this list. It also has large mesh windows so you can look around but also helps with ventilation. The large flooring also offers the ability to create more privacy if you need it by folding it up. This is great if you are looking for a tent that offers privacy for changing or even taking a nap! It also comes with a 2 year guarantee which is more than most models on the market. PROS: Large, includes privacy option, lightweight, easy to set up and has 2 year guarantee. CONS: Too large for some families. That’s all we can come up with! 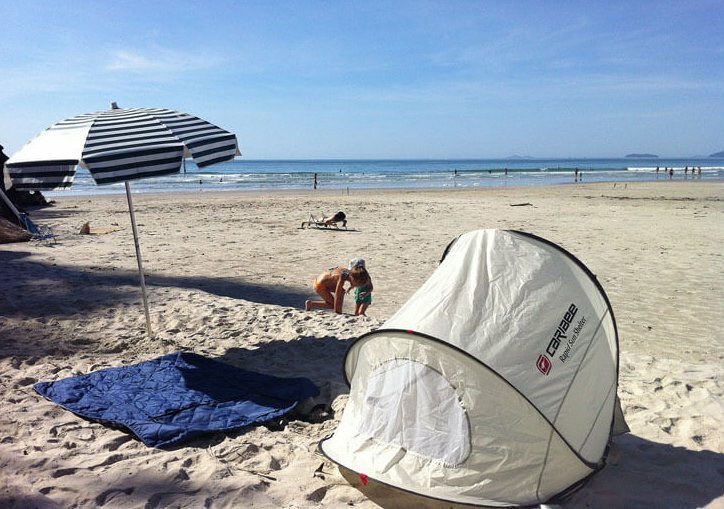 The pacific beach easy up tent is a very popular choice. In fact most places list it as the best beach tent available. It has very easy and fast set up and take down. This is always a great thing particularly as you just want to get on with your day with minimal fuss or nuisance. 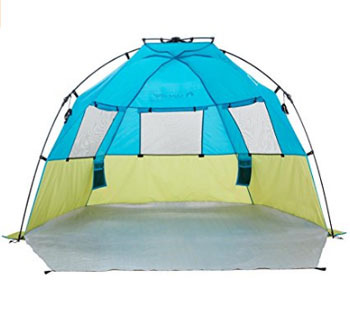 The tent also has a UPF 50+ sun protection rating and has 3 extra large windows for ventilation so it doesn’t get hot and stuffy while relaxing in it. It is made from breathable polyester which is water repellent too. As well as the XL version you can also get a smaller version. We prefer the XL for its versatility but the smaller option is probably more suitable if it is intended mainly for the children. The tent also includes a carry case and there are 5 sand pockets so you can weigh it down with sand so it doesn’t fly away. The tent dimensions when set up: 95 x 52 x 51 inches. The tent dimensions when in the carry case: 38 x 6 x 6 inches. It also comes with a 1 year guarantee. 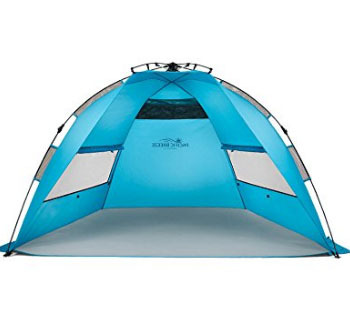 This tent is great if you want something easy to put up and large enough for adults and children to use. This is a great lightweight easy option for a first timer. PROS: Easy to put up, lightweight and plenty of space. CONS: No privacy for changing in. Concerns not enough sun protection. The Lightspeed quick cabana beach tent is easy to set up and take down due to its compression hub system. It is fairly lightweight at just over 6lbs and gives plenty of space for 2 adults. When up it’s dimensions are: 8ft x 4.5 x 4 plus a 4 foot porch of space. It has a UPF 50+ sun protection rating and also has 3 mesh windows with shades for better ventilation and privacy. The floor is made from PE and the poles from fibreglass for stability. It also comes with a 1 year warranty. CONS: May need to buy better stakes as plastic ones are provided. Doesn’t have privacy for changing. The Sport-brella is perfect for the sand but also any sporting event you want to go to but be protected from the elements. Although not a tent, it is a great canopy that works better than a lot of tents on the market. 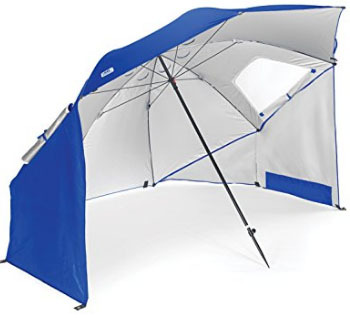 The Sport-brella is a 8 foot canopy umbrella. It is made from 210D polyester which works in all types of weather. It is durable and lightweight so easy to move about. The Sport-brella also has a UPF 50+ sun protection rating and is also water repellent too. The umbrella or canopy has side flaps that fold down to protect you from rain and wind gusts coming from the sides. It’s dimensions when broken down are 54”x4”x4” and weighs around 9lbs. It also has a strap so you can carry it over your shoulder. PROS: Quick easy set up and take down. CONS: As an umbrella, it can catch the wind even when it is a light breeze. This can be overcome by proper placement in relation to the wind and securing it properly to the ground. Of course though it the wind is moving in more than one direction, this properly is going to be a poor choice. No privacy for changing.